Tag Archives for " Holly Chavez "
No matter what type of business you own, it is definitely in your best interests to not only have a website but to also take the time to track your domain’s social impact. After all, a website alone no longer provides a strong enough Internet presence to push your site toward the top of Google’s search engine ranking. Additionally, without a positive and big social impact, you will end up missing out on a large percentage of your potential customers. The best place to start is by selecting a domain name that is going to be easy to remember and spell, which is also highly descriptive of your business. In other words, if you have a law firm in Chicago, you might want to consider having ChicagoLaw as at least one of your domain names. Next, it is important to put certain key tools in place to help you ensure that you are getting the most out of your potential social impact. 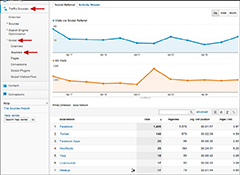 Google Analytics are well-known and loved by website owners of all types because they can sync up with Google AdWords, they provide a lot of information for free and they can be linked into many enterprise software platforms that offer more robust tools. Analytics will give you a good snapshot of how many of your site’s visitors started on Facebook, Twitter or Google Plus, and this is a big piece of the social impact puzzle. Keep in mind that Google determines your site’s influential rating and search engine ranking in part by the links between your social media pages and website. Analytics will show you how many people visit your site after seeing a link on social media, but this is only one piece of the puzzle. 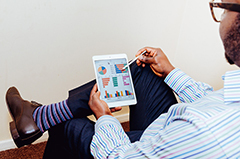 Enterprise software such as the Searchmetrics Suite is able to truly capture the impact that your efforts are having on your company’s social media presence. 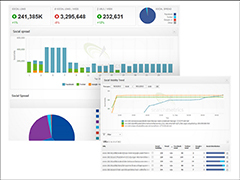 Searchmetrics analyzes the performance of each social media site and provides useful tweaks for improving visibility, monitoring brand perception and optimizing your overall cross-network performance. As previously mentioned, Google ties your social media popularity into your domain’s overall influence score. So how can you boost this score without spending a lot of time and money? 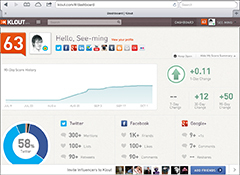 The answer is simple: utilize Klout to see real-time updates on your level of influence. Additionally, Klout suggests sharable content that is well-written and should be of great interest to the people within your social network. This is a good way to get your followers to share your content, which in turn will boost the total number of people who see your company’s name. 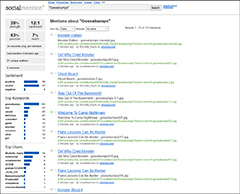 Being able to track social mentions gives you a huge advantage. Placing an emphasis on this will give the ability to see how many people are engaged by your product or service, and you will have the opportunity to respond in a timelier manner to positive and negative comments. Instead of having someone spend a significant amount of time Googling your business name to find the latest posts, you can use Social Mention to see everything in one place. This tool will also tell you the overall strength, sentiment, passion and reach of all of the social posts that mention your company. It is common for businesses to run multiple Twitter accounts, but this makes it difficult to truly track their impact on your domain. 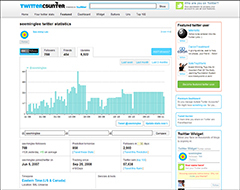 TwitterCounter is a tool that takes care of this problem, and it also makes it easy to determine if your tweets are having the desired impact. An extra feature of this tool is that you can connect more easily with followers who have a high level of social media influence in order to more easily spread the word about your brand. As you can see, there are many ways to track your domain’s overall social media influence. Fortunately, the five options listed above offer a nice combination of features, and they can even give you necessary information that will help you increase the power of your social media reach. Holly Chavez is a content creator and owner of a small online business. She turns to tools that track her domain’s social impact for meaningful statistics for her social media marketing. She also uses them as a part of the fundamental resources needed in order to push her website’s presence to the top of Google’s search engine rankings.